Have you ever felt bad about being you? For a time when I was a kid, I would have given just about anything to have been someone else. I didn’t like way I looked, was painfully shy, and never seemed to fit in. That time of my life was wrapped up in shame. Shame is super uncomfortable. It’s not a belief that you make mistakes, but that there is something fundamentally wrong with you. Often it’s that voice inside of you that tells you you’re unworthy, not good enough, unlovable, even worthless. 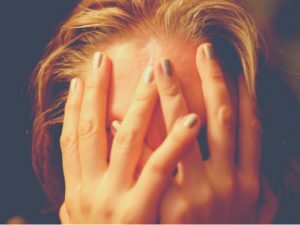 Almost all of us experience shame to some degree or another during our lives. When you get trapped by that way of thinking, it can be easy to forget that it’s not true. I can’t stress this enough, shame is a habit that you can let go of. It doesn’t matter if it’s old mistakes you keep beating yourself up with, or the thought that if people saw the real you, they would want nothing to do with you. You can put down those worn-out thoughts. The key is to reconnect to your sense of value and worth. It’s not always something you can fix overnight, but you begin by creating some new healthy habits. Brené Brown, research professor and author who has studied shame and vulnerability for over a decade, has identified three key things you can do to interrupt the shame. The first thing is to talk to yourself like you talk to someone you love. How often have you caught yourself saying really horrible things to yourself? I’m sure you have heard the advice: talk to yourself the way a friend would talk to you. It would be great if you took that. For me, that really hit home when I had a little girl. Wanting her to embrace all the beauty and wonder I see in her meant I had to step up and be a better example. You deserve the same gentle, loving encouragement you would give a 4 year old. The second thing is to reach out to someone you trust. This involves surrounding yourself with people who honor and value your worth. We can’t help the family we are born into or the people we grew up around, but you can choose people who honor your worth. The third step is to tell your story. It doesn’t matter if it’s a close friend, family member or even a trained professional. Sharing your story with someone who is empathetic can help you reconnect to your sense of value and worth, becoming more resilient against shame. To this wonderful advice I would also add re-parent yourself. Do some deep inner work. You can re-parent yourself with hypnotherapy, letting go of past guilt, regret, and pain. There are many techniques that can be used during hypnosis to help you have a new perspective. Tackling shame can help you feel stronger and more capable to handle whatever life throws at you. Letting go of that old habit will help you handle setbacks more easily. You can set yourself free.